Prague Chamber Orchestra – One of the events at the 2009 International Leadership Association (ILA) conference in Prague was a performance in the Lichtenstein Palace by the Prague Chamber Orchestra – a world-class orchestra that, since its inception, practises and performs without a conductor. 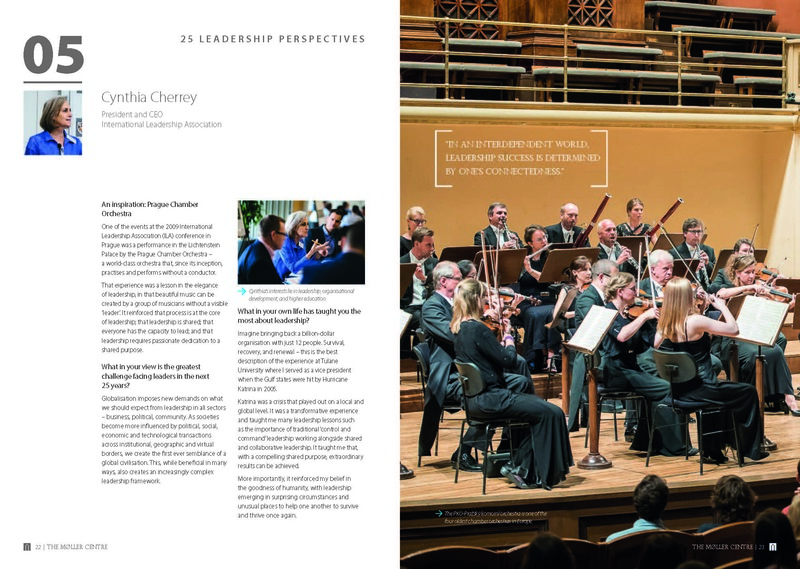 That experience was a lesson in the elegance of leadership, in that beautiful music can be created by a group of musicians without a visible ‘leader’. It reinforced that process is at the core of leadership; that leadership is shared; that everyone has the capacity to lead; and that leadership requires passionate dedication to a shared purpose. Globalisation imposes new demands on what we should expect from leadership in all sectors – business, political, community. As societies become more influenced by political, social, economic and technological transactions across institutional, geographic and virtual borders, we create the first ever semblance of a global civilisation. This, while beneficial in many ways, also creates an increasingly complex leadership framework. Imagine bringing back a billion-dollar organisation with just 12 people. Survival, recovery, and renewal – this is the best description of the experience at Tulane University where I served as a vice president when the Gulf states were hit by Hurricane Katrina in 2005. Katrina was a crisis that played out on a local and global level. It was a transformative experience and taught me many leadership lessons such as the importance of traditional ‘control and command’ leadership working alongside shared and collaborative leadership. It taught me that, with a compelling shared purpose, extraordinary results can be achieved. More importantly, it reinforced my belief in the goodness of humanity, with leadership emerging in surprising circumstances and unusual places to help one another to survive and thrive once again.